I went out to set my GPS on this one (on the priority list- see discussion) on a nice morning, and couldn't find it. A 1998 recovery said at ground level, and there was a 2013 OPUS share solution on it, so I figured I didn't need to drag the metal detector along. Oops. I found the grass torn up 90 degrees out from the post (west) right where you'd expect the disk to be, and figured somebody must have found it last year just under a little dirt but not logged it. But in the shadows there was still icy mud, and I couldn't get a screwdriver down through it easily enough to tell if the disk was there. So I gave up that day. I went back after a couple days of sun, and took the metal detectors this time. Found the disk just under some grass, no digging required, NNW of the post, instead of west, and logged it to GC. So I guess whoever dug out the grass didn't find it. Lesson: make the effort to take all the equipment even when you don't expect to need it. I'll be back on a nice day soon to do the GPS 4+ hour session. If I match the 2013 session well enough, NGS will use our data in the upcoming geoid model. This disk is interesting in that it was reset twice, stamped RESET 1973 RESET 1974. Don't often see that. My guess is that when they planned the road widening it was reset, and then they decided it wasn't far enough from the construction and did it again. And despite this, it is a 2nd order mark. Reset automatically downgrades to 3rd order. It appears NGS did 2nd order leveling to it again sometime before 2002. The more I do this, the more I realize I need a metal detector. My cheap one still works and it has been on lots of adventures and has been used hard. I have had to glue parts of it back on, but it still keeps working. I have to smack it to make it work every time I turn it on, but it still behaves. I recently bought a backup on Ebay. The difference is that it cost $50 instead of $35 and is black. A couple of advantages--it works, it is very light and it telescopes so that it is small enough to stick in a backpack (with the detector head sticking up) so you can carry it anywhere. Here is on on Ebay as an example. I know nothing about the seller so this is meant only as a starting point. I think Famous Trails discontinued this model a while ago. Foxtrot, how did you survive without one? Hehe. One of two ways - I either had a prod stick that, after measuring, I stabbed into the ground to see if I could feel it, OR, I had a small gardeners shovel, and just dug! Lately, though, when out on a drive and such, I've found a LOT MORe to be below ground level - years of silt, or road/rail work have added some ground above the markers, and.. this last trip out through Texas and Oklahoma, it occurred to me that yeah - time for me to get one. Edit: And thanks for the link! 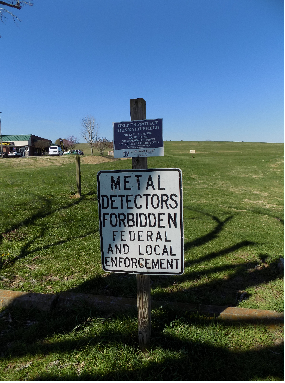 We came across the first one we've ever seen, at a Civil War Battlefield. We had a nice discussion about the policy. I recall years ago one of our DOT licensed surveyors got in big trouble digging for a buried land corner is a historical area of Detroit, for a highway project. 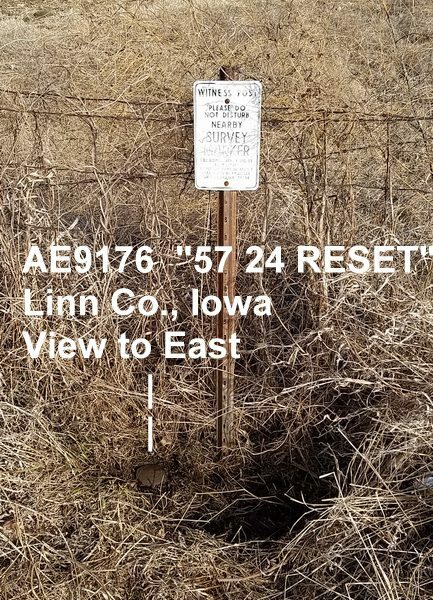 There is state law that allows surveyors to go upon private land to locate boundary markers but it does not cover federal land, He nearly went to jail over the incident and had his/state equipment confiscated.